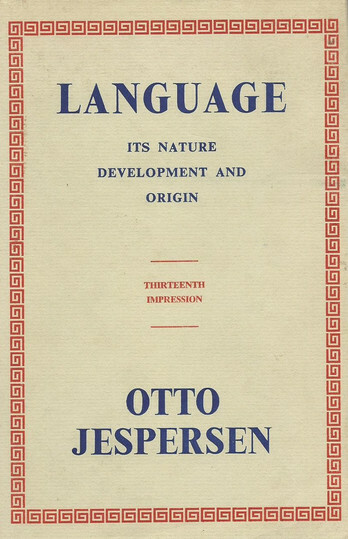 Language: Its Nature, Development and Origin by Danish linguist Otto Jespersen appeared almost a century ago, in 1922. It has inevitably dated in some respects – e.g., occasional sexism and ethnocentrism – but in linguistic outlook it feels for the most part thoroughly modern, compared with some commentary on language change and grammar even today. In March I read the elegant hardback copy (Unwin Brothers, 1959) of Language I picked up in Charlie Byrne’s bookshop last year. A few excerpts follow, more or less in the order they appear in the book. The normative way of viewing language is fraught with some great dangers which can only be avoided through a comprehensive knowledge of the historic development of languages and of the general conditions of linguistic psychology. Otherwise, the tendency everywhere is to draw too narrow limits for what is allowable or correct. In many cases one form, or one construction, only is recognized, even where two or more are found in actual speech; the question which is to be selected as the only good form comes to be decided too often by individual fancy or predilection, where no scientific tests can yet be applied, and thus a form may often be proscribed which from a less narrow point of view might have appeared just as good as, or even better than, the one preferred in the official grammar or dictionary. In other instances, where two forms were recognized, the grammarian wanted to give rules for their discrimination, and sometimes on the basis of a totally inadequate induction he would establish nice distinctions not really warranted by actual usage – distinctions which subsequent generations had to learn at school with the sweat of their brows and which were often considered most important in spite of their intrinsic insignificance. If you haven’t read Jespersen, the passage gives a fair sense of his style: formal in a lightly scholarly way, but infused with lively vernacular (‘the sweat of their brows’) and altogether accessible. He writes long sentences that build to long paragraphs, but his care for logic means the complexity is noticed chiefly in its appreciation; he has a talent too for the pithy phrase. He [Humboldt] rightly insists on the importance of seeing in language a continued activity. Language is not a substance or a finished work, but action (Sie selbst ist kein werk, ergon, sondern eine tatigkeit, energeia). Language therefore cannot be defined except genetically. It is the ever-repeated labour of the mind to utilize articulated sounds to express thoughts. Strictly speaking, this is a definition of each separate act of speech; but truly and essentially a language must be looked upon as the totality of such acts. For the words and rules, which according to our ordinary notions make up a language, exist really only in the act of connected speech. The breaking up of language into words and rules is nothing but a dead product of our bungling scientific analysis. Nothing in language is static, everything is dynamic. Language has nowhere any abiding place, not even in writing; its dead part must continually be re-created in the mind; in order to exist it must be spoken or understood, and so pass in its entirety into the subject. The influence of children on children cannot be overestimated. Boys at school make fun of any peculiarities of speech noticed in schoolfellows who come from some other part of the country. Kipling tells us in Stalky and Co. how Stalky and Beetle carefully kicked McTurk out of his Irish dialect. When I read this, I was vividly reminded of the identical method my new friends applied to me when at the age of ten I was transplanted from Jutland to a school in Seeland and excited their merriment through some Jutlandish expressions and intonations. And so we may say that the most important factor in spreading the common or standard language is children themselves. It often happens that children who are compelled at home to talk without any admixture of dialect talk pure dialect when playing with their schoolfellows out of doors. They can keep the two forms of speech distinct. In the same way they can learn two languages less closely connected. At times this results in very strange blendings, at least for a time; but many children will easily pass from one language to the other without mixing them up, especially if they come in contact with the two languages in different surroundings or on the lips of different people. This supports my recent article in the Guardian, where I argue that banning slang and regional dialects at school is misguided because children can code-switch between dialects and registers. The sixth and last chapter in Book II, ‘The Influence of the Child (continued)’, ponders semantic shifts. Some of these are ‘the product of innumerable small extensions and restrictions on the part of the users of the language after they have once acquired it’. Along with changes of this sort we have others that have come about with a leap, and in which it is impossible to find intermediate stages between two seemingly heterogeneous meanings, as when bead, from meaning a ‘prayer,’ comes to mean ‘a perforated ball of glass or amber.’ In these cases the change is occasioned by certain connexions, where the whole sense can only be taken in one way, but the syntactical construction admits of various interpretations, so that an ambiguity at one point gives occasion for a new conception of the meaning of the word. The phrase to count your beads originally meant ‘to count your prayers,’ but because the prayers were reckoned by little balls, the word beads came to be transferred to these objects, and lost its original sense. It seems clear that this misapprehension could not take place in the brains of those who had already associated the word with the original signification, while it was quite natural on the part of children who heard and understood the phrase as a whole, but unconsciously analyzed it differently from the previous generation. This history of bead was new to me, and fun to consider. Words more often begin with physical reference and become more abstract over time; bead went in a different direction. It’s related to bid, which has had the sense of ‘offer’ for over a millennium; notice also that its cognate in German, bitte ‘please’, retains prayer’s sense of entreaty. Another interesting observation – weird might be more accurate – appears in a nearby treatment of what Jespersen calls stump-words (‘violent shortenings’ of existing words, including names): ‘In the beginning of the last century Napoleon Bonaparte was generally called Nap or Boney.’ Nap or Boney! He also mentions cows more times than I had reason to expect. Many people still believe that an account of the origin of a name throws some light on the essence of the thing it stands for; when they want to define say ‘religion’ or ‘civilization,’ they start by stating the (real or supposed) origin of the name but surely that is superstition, though the first framers of the name ‘etymology’ (from Gr. etumon ‘true’) must have had the same idea in their heads. Etymology tells us nothing about the things, nor even about the present meaning of a word, but only about the way in which a word has come into existence. At best, it tells us not what is true, but what has been true. . . . It would be wrong to say that language (i.e. speaking man) created first what was strictly necessary, and afterwards what might be considered superfluous; but it would be equally wrong to say that linguistic luxuries were always created before necessaries; yet that view would probably be nearer the truth than the former. Much of what in former ages was felt to be necessary to express thoughts was afterwards felt as pedantic crisscross and gradually eliminated; but at all times many things have been found in language that can never have been anything else but superfluous, exactly as many people use a great many superfluous gestures which are not in the least significant and in no way assist the comprehension of their intentions, but which they somehow feel an impulse to perform. In language, as in life generally, we have too little in some respects, and too much in others. If you want to delve further, you can browse or download Language: Its Nature, Development and Origin at the Internet Archive. Update: A version of this post has been published in issue #187 of the Danish magazine Anglo Files. This entry was posted on Thursday, May 26th, 2016 at 6:05 pm and is filed under books, etymology, language, language history, linguistics, semantics. You can follow any responses to this entry through the RSS 2.0 feed. You can leave a response, or trackback from your own site. Note the relation between counting and telling as well. I’m so pleased to see you praising Jespersen. I was given “Language” to read by very enlightened teacher in the 1940s. Jespersen has remained a hero ever since. His English Grammar is extraordinary; the introduction to the last volume, written during the German occupation of Denmark, contains a deeply moving cry of despair. Thanks for the recommendation, Bev. I’ll definitely read more of his books: maybe Growth and Structure of the English Language next, as I have a digital copy. I love the first quote on ‘correctness!’ Very well said. It’s an exemplary description of the One Right Way fallacy.